Individuals from 14 states have testified before a panel of experts, who included activists, journalists, lawyers, legislators, scholars, trade union leaders and politicians, about how their situation of hunger and unemployment were directly linked with violations of the right to food and work, rampant across the country, made worse by the aadhaar requirement. At the public hearing, organised by Right to Food Campaign at Gandhi Peace Foundation, Delhi, Balakram, an adivasi from Chhattisgarh; Shardaben, a Dalit from Gujarat; Pratap Singh, from Madhya Pradesh, and others testified about how they and others in their villages were ration card citing various reasons, including failure to authenticate their biometric finger prints under aadhaar. Vishwanath from Jharkhand revealed how Budhni Soren – a tribal woman from Giridih – died due to hunger in January 2018. Dipa Sinha, who participated in the fact-finding team to inquire about the starvation death of Amir Jahan in Moradabad, Uttar Pradesh, said, the latter’s family did not know how to apply for a ration card. Her husband had to leave the work of rickshaw pulling due to tuberculosis and migrate to Pune in search of work. Debashish, a sarpanch from Koraput, Odisha, said, the situation of food security in his area was grim, underling, of the 1,393 households in his Gram Panchayat, 175 households did not have a ration card, even though they applied for it over a year ago. 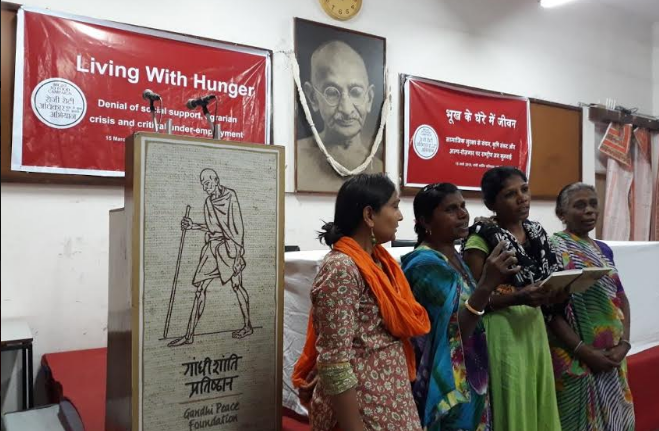 Activist Taramani Sahu from Simdega, Jharkhand, gave detailed testimony about Santoshi’s hunger death due to the cancellation of her family’s ration card in the absence of aadhaar seeding. The meeting also heard details of hunger deaths of three brothers of Gokarna, Karnataka, due to discontinuation of ration for want of aadhaar. The situation was found to be not very different in big cities like Delhi and Amritsar. Homeless persons from Delhi testified that they were unable to get their aadhaar and were denied several entitlements in the absence of identification documents. The meeting was told, there were 19.5 lakh ration cards in Delhi, but in January 2018 almost a quarter of them were unable to access ration due to aadhaar-based biometric authentication failure. Gulshan Khatoun and Maida Khatoon of Noida – which forms part of Delhi’s National Capital Region – testified how they or their family members were unable to get pension because of authentication issues. Ranjeet Kaur, a woman from Amritsar with disability in her leg, had a similar story to tell. Speaking on the occasion, CPI’s D Raja, Rajya Sabha member, said, the country’s elected representatives should be discussing these important issues, while Congress’ Rajeev Gowda, former professor of the Indian Institute of Management-Bangaluru, also from Rajya Sabha, said his party had brought aadhaar, but its intention was not to use the Unique Identification system as a tool of exclusion. 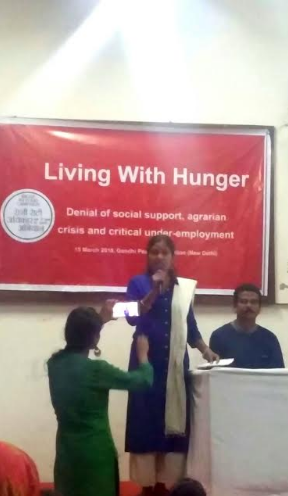 Prof Reetika Khera from Indian Institute of Technology-Delhi said that although many poor households were excluded from the ambit of food security, the Right to Food Campaign should draw strength from its victories. Khera added, the National Food Security Act was one such success – limited as it might be – as it had significantly expanded the coverage of the Public Distribution System (PDS). Others who heard the testimonies included Annie Raja, Bhasha Singh, Harsh Mander, Kavita Srivastava, Mira Shiva, Neha Dixit, Prashant Bhushan, Saksham Khosla, Vandana Prasad and Usha Ramanathan.